PA Chairman Mahmoud Abbas meeting Sunday with Hamas politburo chief Khaled Mashaal in Qatar. 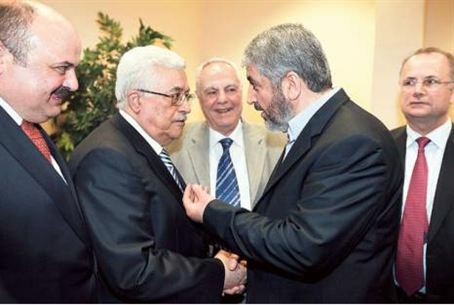 PA Chairman Mahmoud Abbas is meeting Sunday with Hamas politburo chief Khaled Mashaal in Qatar. The meeting, postponed from a meeting cancelled last Thursday, is intended to further a discussion on the formation of a Palestinian Authority unity government that technically was to follow an agreement signed last May. Both men flew to Qatar on Saturday from Amman in order to be ready to start talks on Sunday. Each had met privately with Jordanian King Abdullah II prior to their departure. Abdullah has been actively involved in trying to get final status talks between Israel and the PA back on track. The two men are also expected to discuss the general political situation in the region, and how that has affected the status of the PA vis a vis talks with Israel. Hamas deputy politburo chief Moussa Abu Marzouk told reporters that Abbas had been the one to request Doha as the venue for the talks, but did not say what his reason had been. In the past, the two men have met in Cairo to negotiate over a formation of a PA unity government, but for years have been unable to follow up any agreement they have reached. Hamas is still unwilling to meet the conditions of the Quartet of peacekeeping nations – the U.S., Russia, the United Nations and the European Union – that call for the terror group to renounce violence, recognize Israel's right to exist and to uphold agreements signed by previous PA governments. The Hamas rulers of Gaza, who seized control of the region from their Fatah rivals in June 2007, are unwilling to change the group's charter, which calls for the elimination of the “Zionist entity” and does not recognize the State of Israel. Although Fatah appears to the West to be more moderate, in reality it is not much different. Fatah provides material support to terrorist entities via salaries to Gaza, and moral and media support as well through children's television programs on PA TV that glorify terrorists as heroes.